Pepper Rasam or Milagu Rasam is always a comforting food for my family when anyone gets cold. That too my mom makes it so simple and avoid tomatoes in it. 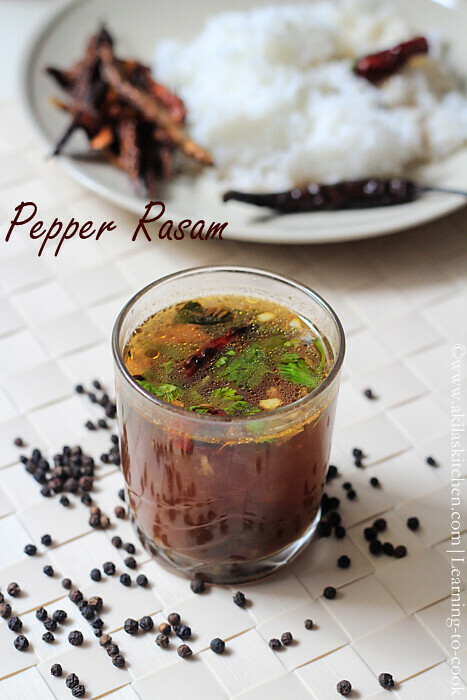 When I get cold in my childhood days my mom used to prepare this and I will drink this pepper rasam. 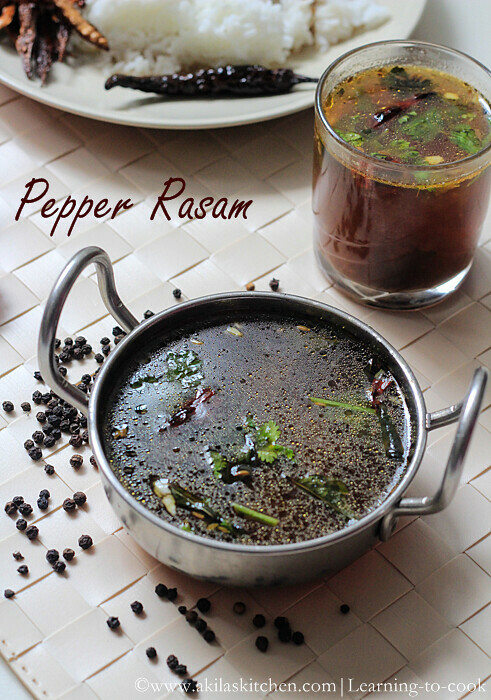 There are many varieties in making this pepper rasam by adding dal water, tomatoes, etc. But here we see the simplest way. 1. Take the ingredients and soak the tamarind in 1.5 cups water. Let it soak for atleast 10 min so that you can get the tamarind extract easily. 2. Crush the pepper, cumin seeds and garlic. Crush the tamarind and Extract the tamarind water. Keep it aside. 3. In a kadai/wok, add the oil and when hot add the Urud dal and when it becomes light brown, add the curry leaves and red chilli. Fry for a minute and then add half the crushed pepper garlic paste. Fry them again until nice aroma comes. Add the tamarind extract. 4. Add the remaining 2 cups of water and add the asafoetida and remaining crushed pepper garlic. At this stage if you want you can add the rasam powder. (I have not added here). 5. Add the ghee and when it starts boiling add the coriander leaves. 6. Just allow to boil for 2 min and switch off. 7. 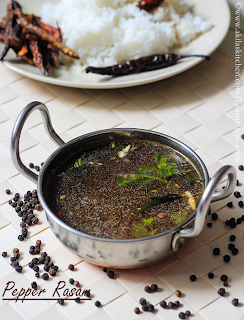 Serve the hot hot Pepper rasam with hot steamed rice and serve the potato poriyal or spicy potato roast as a side dish. You will really feel better after having this rasam when u get cold. An all time comfort rasam. Healthy and flavourful. 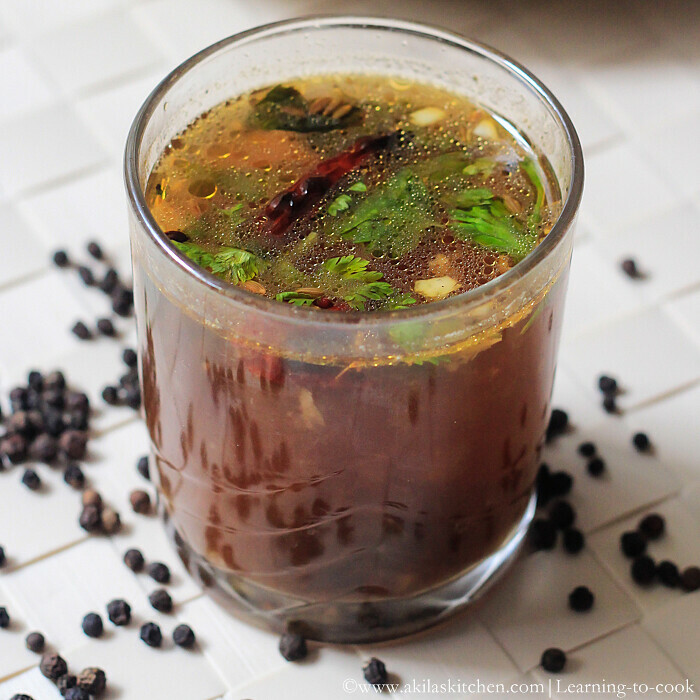 Pepper rasam is my weakness. 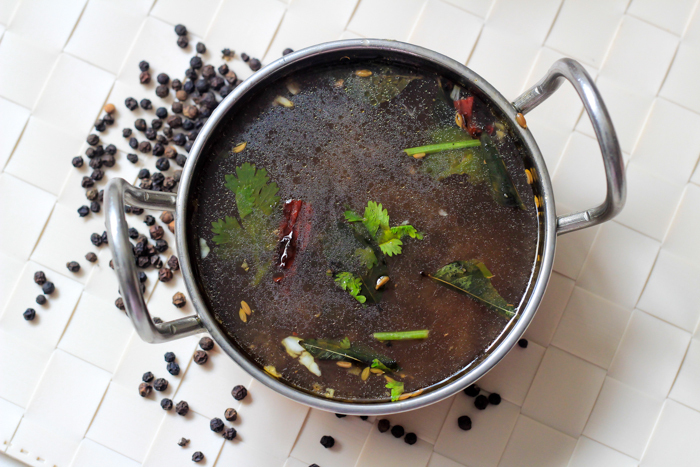 Love this pepper rasam. Never say no to rasam, our fav and almost every week its on our table. 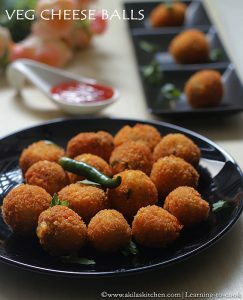 Will try this peppery version for this weekend. 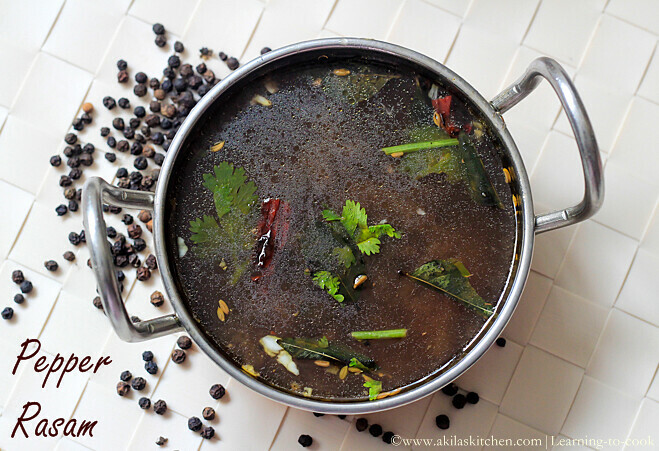 Nobody can say no to this lovely pepper rasam. When ppl gets sick, This rasam is one of the handy to go and get away the cough and cold.Can be drunk in the form of soup too.Well presented akila. My comforting food, one of my favourite pepper rasam,just drooling over that glass of rasam. This is just the right kind of rasam to get rid of cold. Looks very inviting. Looks tangy and yummy ! yum, spicy and delicious. perfect for cold weather.